This combination is something unexpected, but has turned up with huge surprise on more interesting note. The untitled film of Surya's next will be directed by Lingusamy and is produced by Subash Chandra Bose of Tirupathi Brothers. The film had a test shoot this morning and cinematographer Santhosh Sivan has used 'Red Dragon Camera'. This is the first film in the entire world to be shot with this camera and not even Hollywood has tried with this one. This morning, the test shooting was held at Prasad Studios that was graced by the engineers of Red Dragon and Angenieux lens. Soon after this film, A-league director Ridley Scott will make a film with this camera. 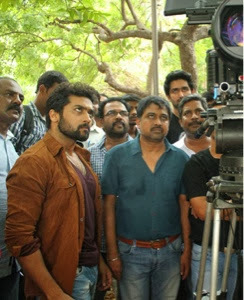 Working with Surya and Lingusamy for the first time, cinematographer Santhosh Sivan says, "It's a good project. What impressed me a lot about this film was the racy elements in the script narrated by Lingusamy that is mixed with a lot of commercial elements." The film will go on floors from November 15 and will shot in full-stretch till April 2014. The makers are planning to release the film in May 2014. Samantha plays the female lead role opposite Surya and rest of the cast are yet to be finalised. The film has musical score by Yuvan Shankar Raja, cinematography by Santhosh Sivan, art by Rajeevan, Anthony on editing and Brinda Sarathy writes dialogues. 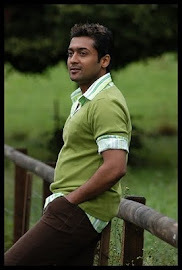 A scene involving Surya rendering some dialogues was shot inside the indoor studio and later the Santhosh Sivan-Surya-Lingusamy trio made a test shoot for the view of media channels.